Learning to swim is not always easy, yet gaining this important life skill can lead to a real feeling of accomplishment. As well as the serious safety implications, the health benefits to be gained through swimming make learning well worth the effort – swimming really is a skill, that once learnt, really can prove beneficial for life. 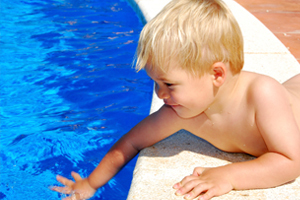 Once taught, most children will enjoy endless hours, splashing around, swimming and having fun. The act of learning to swim, in itself, can really serve to boost a child’s self-esteem, and teaching children to swim can ensure that they feel safe and confident in water. As well as the fun to be had, the important safety implication should never be overlooked as teaching a child to swim can help to ensure their safety in and around water – greatly reducing the chances of water related accidents. If you own a swimming pool, try to teach children as early as possible as it may well save their lives if they ever end up in the pool unexpectedly. As with many things, learning to swim can be easiest if mastered at a young age, yet often, and for a variety of reasons, people reach adulthood without ever having learned. In fact, statistics show that around 20% of adults living in the UK (that’s a staggering one in five of us! ), are unable to swim. Adult non-swimmers often experience feelings of fear, water related vulnerability and embarrassment. Unfortunately, these negative feelings have a tendency to deepen as we get older, so it’s little wonder that adults are often very hesitant, when it comes to taking the first steps in learning to swim. But learning to swim should not be avoided – imagine the feeling of success that overcoming such deeply routed fears can bring! Invest in a good pair of goggles – being able to see underwater will help you feel confident and at ease whist learning. Try to remain calm, relax and concentrate on your breathing – relaxing and breathing steadily will increase your ability to stay afloat. Attend group lessons – you may find that you enjoy sharing progress and experiences, with others. Practising frequently, will help to build confidence. If you’re using inflatable floatation aids, consider gradually deflating them as your skills improve – you should soon find that they’re no longer needed. The health benefits of learning to swim can be vast, as through swimming, we can perform a full body work out, building endurance, physical strength and cardiovascular fitness. It is also widely believed to help reduce stress and often provides other psychological benefits. Another benefit to swimming is that it can be enjoyed by people of all ages, and of all levels of physical fitness. It’s a very sociable activity, allowing you to get involved, relax with friends and family and get the most out of your holidays. Swimming classes for children and adults are available at leisure centres nationwide. Contact your local leisure centre for information on times and dates of upcoming swimming classes in your area. Adult swimming classes are often held in small groups, generally during the evenings and private classes may be available. If you would like information on swimming aids or water safety and children, please visit the relevant pages. If you’d like to share your comments, or experiences, (perhaps to inspire others to take the plunge!) then please use the box below.